In all honesty, there wasn't too much of a fan uproar earlier this week when it was announced that director Seth Grahame-Smith had bailed on The Flash movie. But it sounds like there are more problems brewing at DC Comics and Warner Bros. 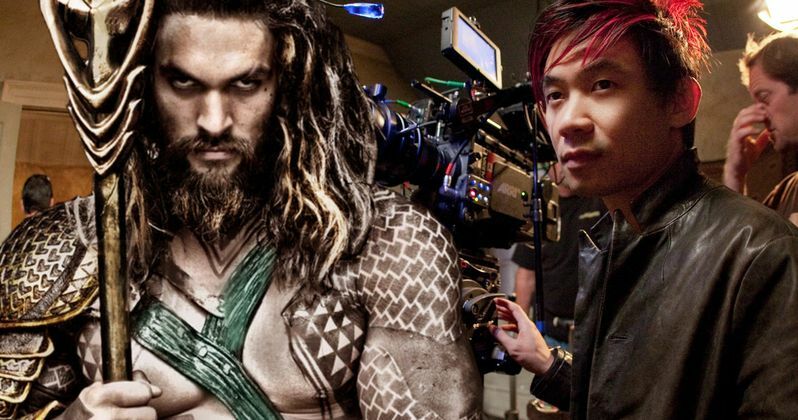 In the wake of this departure comes news that fan-favorite director James Wan might be the next to flee the DCEU compound. Signed to The Flash movie since last October, writer and director Seth Grahame-Smith has cited 'creative differences' as his reason for leaving. Those differences have yet come to light. Similar circumstances surrounded Wonder Woman last year, when Michelle MacLaren exited before shooting was set to start. She also claimed 'creative differences' had driven a wedge between her and the project. She was later replaced by Patty Jenkins, and shooting is about to wrap in Italy. So, as you can see, not all is lost when DC and WB lose a filmmaker. Though, the latest rumor might hit a little harder than the previous two, as director James Wan has built a loyal fan base having created the Saw and Insidious horror franchises. He's also the man behind The Conjuring and Annabell, and he brought in a blockbuster hit with his sequel Furious 7. He is set to director Aquaman next, with the movie targeting a July, 2018 release date. Though, it sounds like that might not happen. Birth.Movies.Death have sources closely embedded at the DC compound, and as they tell it, losing Seth Grahame-Smith as director of The Flash is only a tiny fraction of the trouble brewing at Warner Bros. No one involved with Batman V Superman were expecting the negative response and lackluster box office, with many executives now questioning Zack Snyder's vision for Justice League. And there is hesitation as the DCEU hurtles forward. There wasn't much time to stop the train and set it right on the tracks, though. Justice League, which is now shooting in London, was set to go before cameras just mere days after Batman V Superman was released in theaters. The studio was hard-pressed to course correct the ship. Because everything was already in motion, it's reported that Warner Bros. and DC had their hands tied. They didn't want to remove Zack Snyder from Justice League because they were worried that the bad press might worsen the box office receipts for Dawn of Justice. This, apparently, led to multiple in-house fights between Snyder, his team and the WB executives. And it seems that Snyder is currently working under an insane amount of pressure, which is why we haven't heard much from Justice League during its first stretch of principle photography. While no exact details have been revealed in terms of the 'creative differences' that bubbled up during pre-production on The Flash, those problems are said to have spilled over to Aquaman. The DC sources close to the project claim that James Wan is suddenly feeling an enormous amount of 'trepidation' as he stumbles forward in a universe that is wobbly at best. It is noted that Furious 7 was one of the director's most challenging and difficult shoots. He lost his leading man in Paul Walker 2/3s of the way through shooting, and reportedly had quite a lot of difficulty from some of his cast and crew. He will soon be out promoting his two horror movies, with The Conjuring 2 opening in June, which he directed, and Lights Out opening in July, which he produced. Both are expected to be huge hits. And both are housed at Warner Bros., where the Aquaman movie lives. So it will be interesting to see how the director and studio respond to this. It's not likely that the studio will simply cut one of their best working relationship's loose. Sources claim that Aquaman might get delayed to get the movie just right, but there is no telling how true that statement might be. Justice League is still moving full steam ahead as we speak, and it will help set up and define the rest of the DC Movie Universe. It will be interesting to see how this all plays out. Suicide Squad is next in the line-up, and arrives in theaters this August. Fan anticipation is quite high for this super villain adventure, and it might put DC back on the right course. Though, it doesn't exactly fit into the Justice League universe of heroes. How this will all shake out in the long run is anyone's guess.